I’m making the argument that everyone should have a small, kitchen flock of laying hens. Anywhere from 2-6 hens. Back during the second world war, the government actually encouraged people to keep hens. There are pictures of posters floating around the internet of such. These days you are more likely to get fined for having a couple hens in most places. Figure they lay anywhere from 4-6 eggs per week per hen. Eggs are used in almost all cooking, they are too versatile not to have around. They are an easy way to ease in to self sufficiency. Eggs, are one of those low hanging fruit that you should not be getting from the grocery store. They quality differences from farm grown eggs are obvious and substantial. Most people then ask, well aren’t all eggs grown on a farm? I suppose in a general sense, the answer is yes. But, my hens live a very different life compared to those hens in battery cages in an industrial building. My hens, scratch, peck the ground, eat bugs, dust bathe and lounge at their leisure. They eat non GMO feed and any scraps from my kitchen or garden, which they relish. In turn they give me about 5 eggs a week per hen. We’ll have a bigger discussion in another post on GMO and why you should eat around them whenever possible. I used to spend about $3 a dozen for eggs from a small farm market where I knew the hens lived a good life. You can expect to pay closer to $5 a dozen at a farmers market, in some city markets even more. I do not think I save a lot of money growing my own eggs over buying good eggs. Do not even compare them to store bought eggs. They are not comparable. I bought my hens already laying. It is not good business to grow hens from chicks, although it may be more fun and you know what they have been fed. Last I checked it might take around 15lbs of feed to bring a hen to point of lay. About $5 when using the premium non GMO feed I buy. That’s not the bad part. A $2 chick and $5 of feed makes for a pretty thrifty hen. The problem is the length of time. Hens need at least 4 months to get to point of lay. 6 months being average. I bought my first 4 for $100, a little on the high side. I bought my last 2 hens for $16 each. I’d prefer to find hens for 12-15 each, but don’t travel to far to find it. I consider myself ahead of the game because I am not waiting 20 weeks or more for my hens to start laying. I used scrap lumber to build an a frame coop. I have a days labor or so in the coop construction, but got all the scrap from a construction jobsite. I use portable electric netting for fencing. I do not keep it electrified. Most of the time the girls stay behind the net and it isn’t a problem. They roam around in the fence which is about 40×40 square. Every few days I move the coop to fresh ground. This keeps things clean, gives the soil a chance to assimilate the nitrogen and prevents disease. I only use non gmo feed which I buy from a local distrubutor who buys from an Amish mill. It costs me around $30 a 100lb bag. This lasts me at least a month. I estimate the girls eat about a quarter pound a day each. So, if I have 6 hens that eat 1.5lbs of feed a day i use 10 ½ lbs a week. $3.15 a week feed bill. I get about 28-30 eggs a week or about $1.25 a dozen. Maybe most important, I am opting out of the main stream systems. As long as I have some feed on hand my hens lay whether there is economic catastrophe or natural disaster. I don’t have to leave my homestead to get them. In a real pinch, they could be turned loose and fed scraps and make out perfectly fine. It is really worth your while, to keep a hen for each person in your home. Even 2 hens, (chickens do better with at least 2) will give 8-10 eggs a week for almost no work and no trouble. And in real desperation, you can always eat the goose that laid the golden egg. 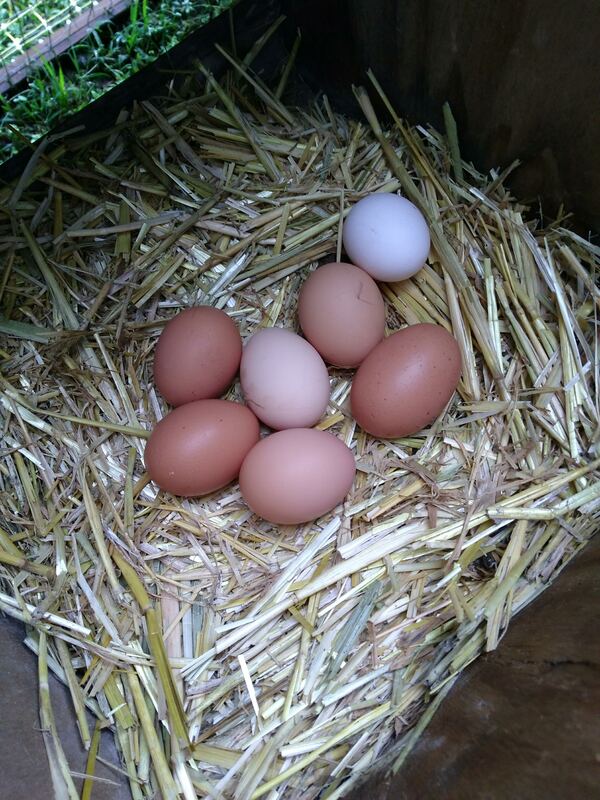 Laying hens start to become freeloaders after a couple of years. These hens get culled and go in the stew pot. They can be tough but if you simmer them in a pot of dumplings their flavor in unbelievable. I really like hard boiled eggs. Other ways are okay, but my favorite is pickled eggs. If you save your pickle juice and plop the eggs in it after the pickles are gone, that is the easiest way I have found. Man they are good with a little salt. We make egg salad fairly often. Another of my favorite ways is egg fried rice. I learned to stir fry and how Asian food worked a couple years ago and it is pretty easy and so good to make at home. I have modified a recipe to use a dozen eggs. My last favorite way to use eggs is to make what I call a breakfast skillet. Fry up some bacon sliced in 1″ chips. Add chopped onion half way through. Pour off some bacon grease. Add 1 dozen scrambled eggs. Add 1 can rinsed black beans. Keep turning eggs until they cook. Right at the end add 1 block of shredded cheddar cheese. Great article. I really like the blog.